by Henry J. Kauffman. Softbound, 166 pages, 8" x 11". 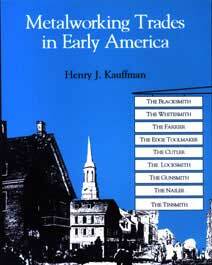 A fascinating and informative survey of the metalworking trades in early America. Each is covered in its own separate chapter: The Blacksmith, Whitesmith, Edgetool Maker, Cutler, Locksmith, WheelwrighGunsmith, Nailer and Tinsmith. Introductory chapters describe and explain the blast furnace, forge and iron foundry process, etc. Mr. Kauffman describes not only what was made but how it was made. Includes over 200 illustrations.